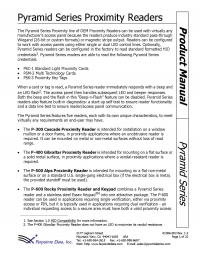 Product manual for the Pyramid Series readers including specifications, wiring, configuration and a troubleshooting guide. Pyramid Series Proximity readers feature the option of either HID or AWID 125kHz compatability. 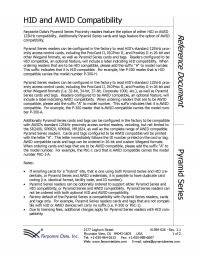 Additionally Pyramid Series cards and tags feature the option of HID or AWID compatability. 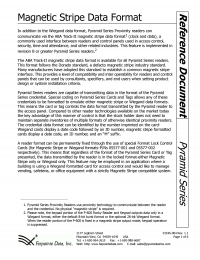 In addition to the Wiegand data format, Pyramid Series Proximity readers can communicate via the ABA Track-II magnetic stripe data format (clock and data), a commonly used interface between readers and control panels used in access control, security, time and attendance, and other related industries. This feature is implemented in revision B or greater Pyramid Series readers. 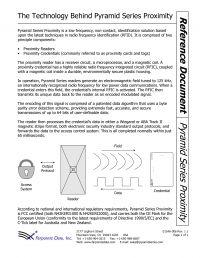 Pyramid Series Proximity is a low frequency, non-contact, identification solution based upon the latest techniques in radio frequency identification (RFID). 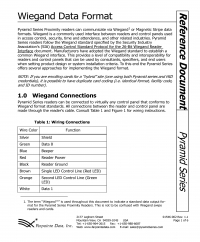 Pyramid Series Proximity readers can communicate via Wiegand or Magnetic Stripe data formats. Wiegand is a commonly used interface between readers and control panels used in access control, security, time and attendance, and other related industries. 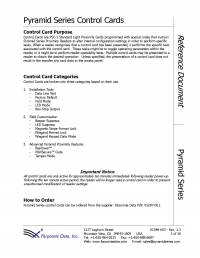 Pyramid Series control cards manual including features, and technology specification. 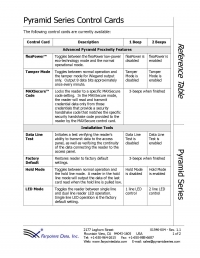 Quick overview of the Pyramid control cards.